1000 Worte Forschung: PhD project (Medieval History) finished in 2016, Radboud University Nijmegen. After the outbreak of the Great Western Schism (1378-1417), Europe faced a serious religious crisis. Within religious orders, so-called ‘Observant’ reformers tried to halt the perceived decline in morals and religious observances. They wanted to reform their own orders, and through this, society at large. This thesis investigates the collective self-understanding of one of the main missionary orders in this period: the Order of Preachers, commonly called Dominicans after their order founder St. Dominic. Zealots for Souls explores historical and hagiographical narratives written by Dominicans to serve a predominantly Dominican audience, and considers them as expressions of a Dominican identity. Part 1 of the thesis (Writing the Dominican Past) studies how Dominicans wrote institutional history in the long fifteenth century, a period characterized by struggles for Observance within the Dominican order. What topoi were developed in these institutional texts, what methods were employed, and in what forms did the texts appear? How did a Dominican author, trying to present the Dominican past, approach this past, and how did he cast this into a narrative structure? In order to introduce the many types of narratives that have survived, I divided them into the following categories: order chronicles that envisage to inform about the whole order (Chapter 3), convent chronicles that focus on a certain friary or nunnery (Chapter 4), and collective or serial biographies that, instead on chronology, focus on groups of Dominicans (Chapter 5). To a greater or lesser extent, these texts often reproduce the same kind of materials. This is not surprising if one takes into account that the aims of the authors overlapped as well: edification, remembrance and contributing to a sense of Dominican collectiveness. With these functions in mind, we can better understand the multiple forms in which the institutional narratives appeared. Medieval historiography at large was written to honor God and to demonstrate the workings of divine providence. In the case of Dominican narratives, this concerns the providence God has for the Dominican order in particular. By learning about the dignity of the Dominican order and the exceptional love and protection bestowed on it by God and the Virgin Mary, the love of friars for their own order was supposed to increase, and they would be handed the elements by which they could shape their Dominican identity. In their institutional narratives, Dominican authors often repeated the same religious message. Inspired by the Dominican liturgy, they conceived of their order as a fertile vine planted by the Lord. With biblical metaphors, Dominican authors emphasized their unique role in salvation history. They presented themselves as zealots for souls and stars in sanctity, assigned with the heavenly task of taking care of the Lord’s flock. 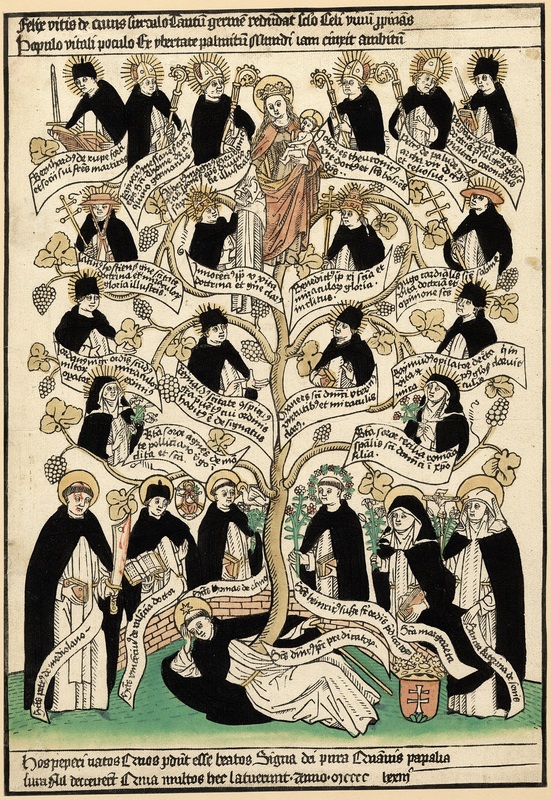 Geneological tree of the Dominican order. Woodcut, hand coloured, 1473 (Source: London, British Museum, Prints and Drawings, 1872,0608.344; Licence: CC BY-NC-SA 4.0 The Trustees of the British Museum). From the beginning, the memory of the Dominican order was founded on a celebration of the collectivity. The compilation of collective biographies constituted a genuine Dominican policy. Dominicans were repeatedly encouraged to update and continue the thirteenth-century Vitae fratrum. Collective biographies were considered to be of primary importance for fostering a proper Dominican identity. By reading the stories about exemplary predecessors, Dominican friars and sisters would live a more honest and virtuous religious life – so it was believed. The categories that are used to structure the Dominican family are revealing in the light of Dominican self-understanding. 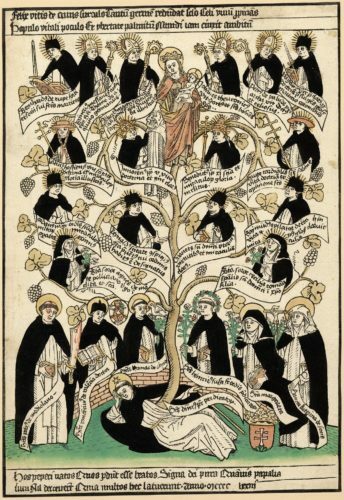 In the eyes of the authors, the portraits of saints, martyrs, prelates, doctors, reformers, nuns, and tertiaries together showed the fullness of Dominican virtue in all its manifestations. Counter to what some might expect, the inquisition was not an essential element in the Dominican self-understanding. Never were inquisitors presented as a category of illustrious Dominicans. Part 2 (Dominicans, Observance, and Humanism) fleshes out dominant themes in the narratives: the need for Observance, and the propagation of the Dominican Observant movement. It shows that the Observants, a minority within the order, were the main constructors of the Dominican narrative identity in the fifteenth century. Observant Dominicans wrote history to justify their own reform agenda. Observant reform is a central theme in the majority of the order chronicles written in this period. The Observants considered the reform of their order as a necessary step in a larger reform process, which was eventually supposed to affect the whole Christian world. Chapter 6 traces the appearance of Observant identities in Dominican institutional narratives, and shows how authors depicted the beginning and progress of the Observant movement. Chapter 7 investigates what specific strategies Observant authors employed and what topoi they used to promote and legitimize Observant reform. Chapter 8 focuses on the ways in which specific Observant models were portrayed, and compares these to descriptions of the master generals of this period. Finally, chapter 9 reveals how Italian Dominicans, trained in the studia humanitatis, tried to make the Dominican literary tradition compatible with humanist standards by rewriting the lives of brothers in Ciceronian Latin. The humanist contexts influenced the Dominican institutional texts. The many prefaces and dedications demonstrate a preoccupation with authorship not encountered before. The writers of Dominican vitae are now lauded as individual literary men worthy of abundant praise. Moreover, humanist authors such as Leandro Alberti, who was responsible for the monumental De viris illustribus ordinis praedicatorum printed in Bologna in 1517, emphasized a connection with classical traditions, while remaining as silent as possible about the medieval sources on which the vitae were actually built. Alberti’s collection is the first Dominican institutional text with a proper title page, on which the ‘authors’ trained in the studia humanitatis figure prominently (even if they only rewrote existing medieval lives in humanist Latin). Anne Huijbers studied History at the University of Groningen and Medieval Studies at the University of Leeds (UK). In October 2010, she started to work on her PhD-thesis at Radboud University Nijmegen as a member of the NWO-research project Religious Orders and Religious Identity Formation in Late Medieval and Early Modern Europe under the supervision of Peter Raedts and Bert Roest. She won the Frye Stipend to fund research in Italy and she was awarded a research grant from the Zeno Karl Schindler Foundation for a stay at the University of Basel from May to October 2015. From September 2016 to August 2018, she is NWO Rubicon Fellow at the École Française de Rome for her research on the last imperial coronations in Rome in the fourteenth and fifteenth centuries.